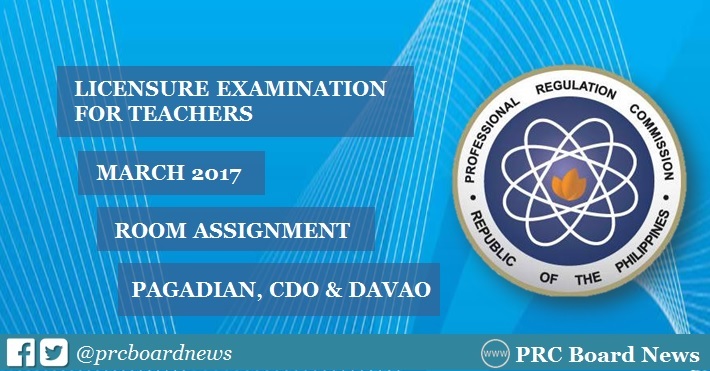 (Updated March 21) The complete list of room assignment for March 26, 2017 Licensure Exam for Teachers (LET) in the cities of Pagadian, Cagayan de Oro and Davao are available on this page as released by the Professional Regulation Commission (PRC) in several working days before the tests. On Wednesday, room assignment for Pagadian has been announced. UPDATE: PRC has released room assignment for Davao and CDO on Monday, March 20. Aside from Pagadian, CDO and Davao, the March 2017 LET will be held simultaneously in the cities of Baguio, Cagayan de Oro, Catarman, Tacloban, Lucena, Puerto Princesa, San Jose (Occidental Mindoro), Cebu, Iloilo, Legaspi, Tuguegarao, Rosales and Tacloban. Note: PRC Board News (PBN) will also update this website for the release of March 2017 LET results. Stay tuned for announcements.